London on a Saturday morning isn’t something I’m usually brave enough to face. I don’t like London; it’s busy, the tubes are packed and the people are miserable. But, the last Saturday in June is an exception and I happily risked my peaceful Saturday to face down everything London can throw at me. Rolling into central London in the afternoon, I did get a few odd looks and stares as people glanced back to read my shirt – which had the rainbow coloured ‘HOMO’ written across my chest. Outside of SoHo, no one seemed to realise that today was London Pride. Not my first pride by a long shot, but my first one celebrating with the thousands of people that come from all over to see London at its loudest, happiest and gayest. Manchester Pride is an event that takes over the whole city. London is so big that even though the parade runs through half the city, no one seems to acknowledge or even know that it’s going on. People’s indifference inside London had very little to do with the attitude of the people who were celebrating. Streets flooded with people who were glittering or shirtless or clad in leather. Every sexuality you can think of was there, flags proudly draped around their shoulders as they laughed and cheered even as the rain threatened overhead. The parade was an all-day event and we caught a good few hours of it, cheering until we were starving, following rainbow-clad celebrators into burger king for a respite. If you’re done with the parade you can head over to Soho Square and explore the pop up white stalls filled with charities where you can buy wristbands and flags and get free sweets and as many leaflets as you can imagine. We tried to go out in the night for the Pride Clubbing Experience but it turns out that only about a tenth of people come out in the day and the streets in the night are flooded with plastic cups and sweating half-drunk partiers. If I had to sum up the experience, the word would be ‘busy’. But I didn’t care. I’ve found that no matter where you are (or who is marching in the parade, or how busy it is), Pride isn’t about that. It’s about the smiles and the singing. No one was rude when you had to squeeze past them, instead they’d try and move, compliment your hair ask if you liked their glitterbeard. It’s about the multi-coloured hair and dancing to the street music, about the cheering as the thunder itself seems to celebrate the huge collection of individuals coming together to just be proud. 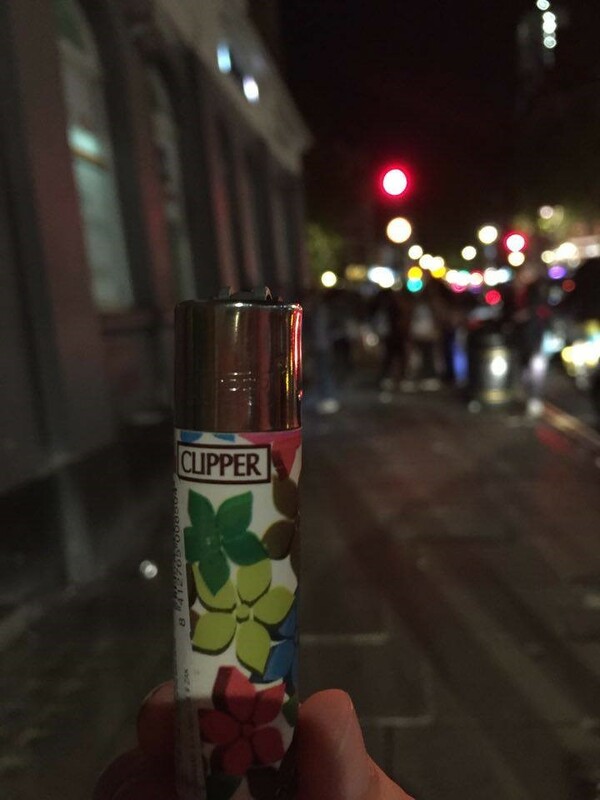 My lighter was bought from a tourist shop on the way back to grab drinks and dress fancier for the night, and the picture was taken as we decided Pride didn’t need to be celebrated out in the streets, but surrounded by friends with a kebab and a glass of skittles vodka.